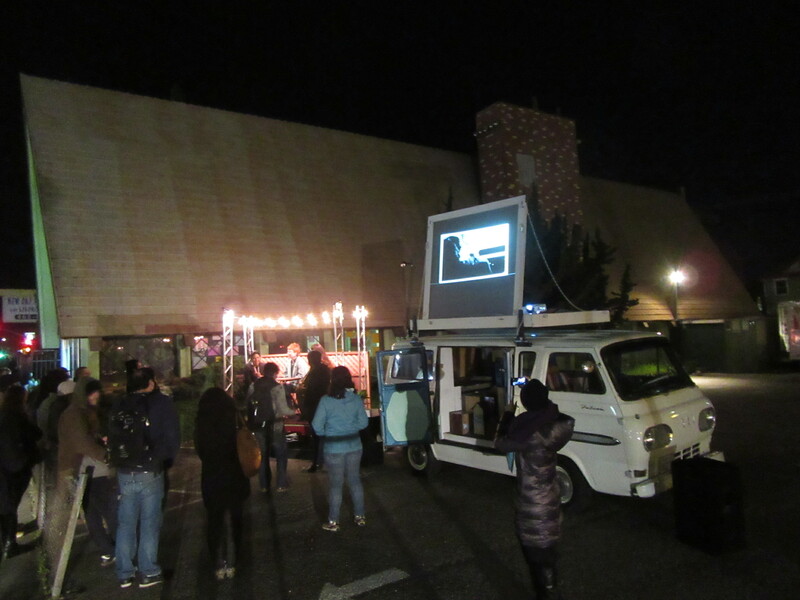 Artists Peter Foucault and Chris Treggiari (Mobile Arts Platform) in collaboration with photographer Victoria Mara Heilweil have begun their Studio Lab Residency at Pro Arts. 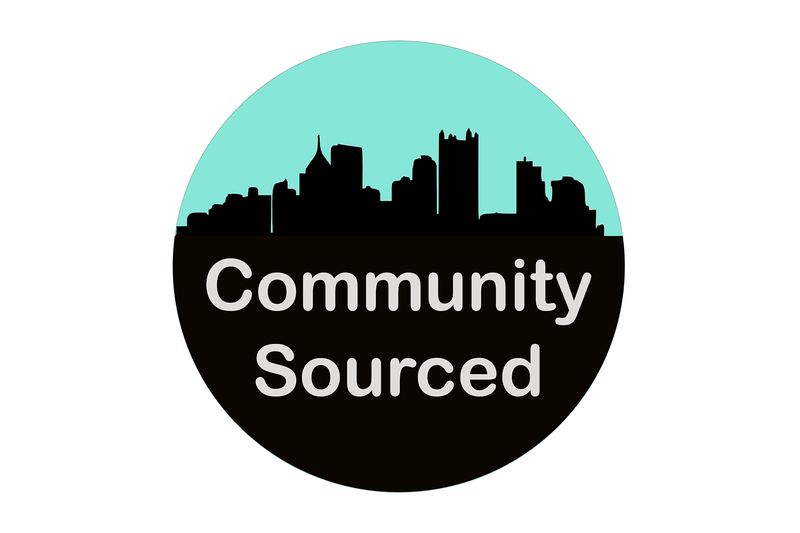 For their residency, they will be researching and producing the second episode of “Community Sourced,” which will feature a micro-portrait of the downtown Oakland neighborhood sourced from interviews and interactions with residents and businesses within a 5 block radius. 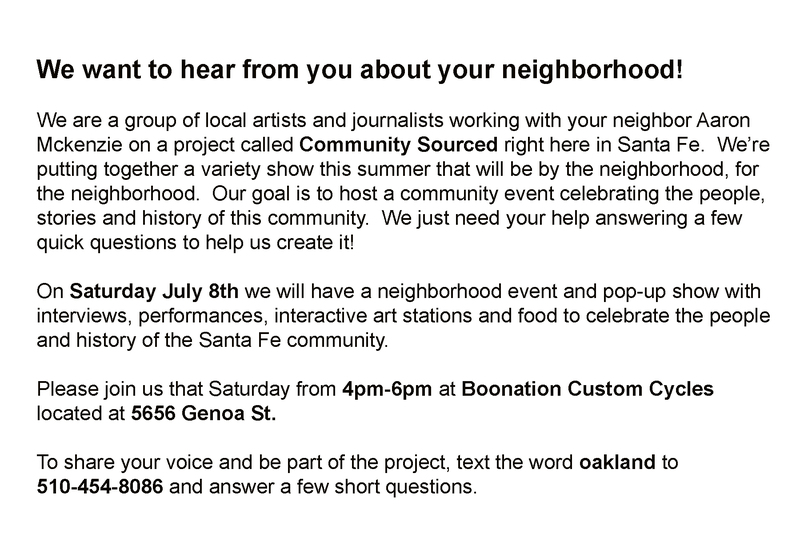 Their initial outreach and scheduled interviews include Luan Stauss, the owner of Laurel Books; Annalee Allen, an Oakland historian; Jennifer Easton and Barbara Goldstein, talking about the BART art master plan; and the African American Museum and Archives on 14th Street. 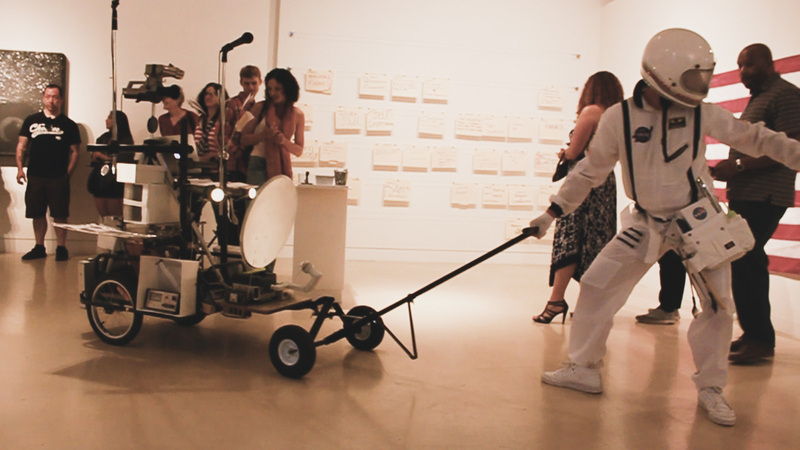 Each episode will result in a video and accompanying book, which will be exhibited at Pro Arts’ Project Space in October. 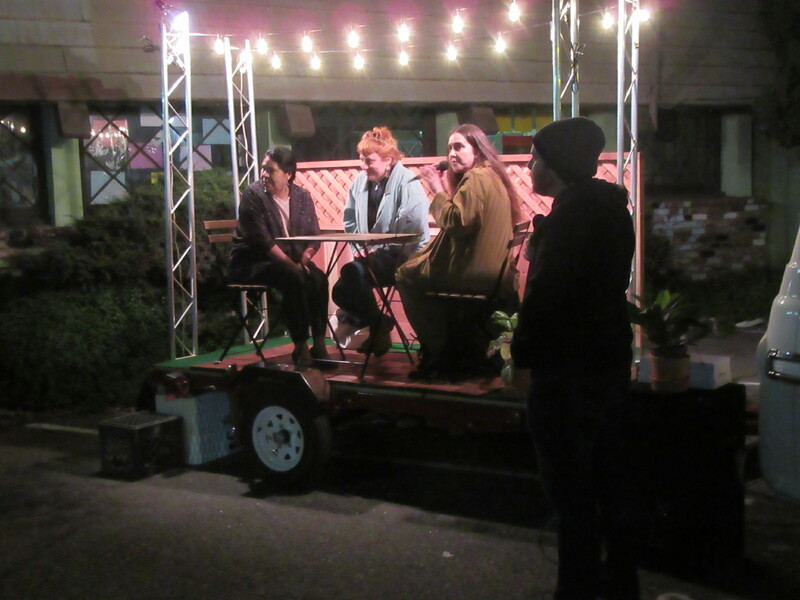 You can find Foucault, Treggiari and Heilweil conducting research, interviews and public engagements on Frank Ogawa plaza from 11:00am – 1:00pm, Tuesdays and Thursdays in September. If you would like to be interviewed, please email info@proartsgallery.org to set up an appointment. Tuesday – Friday: 12:00 p.m. – 6:00 p.m. 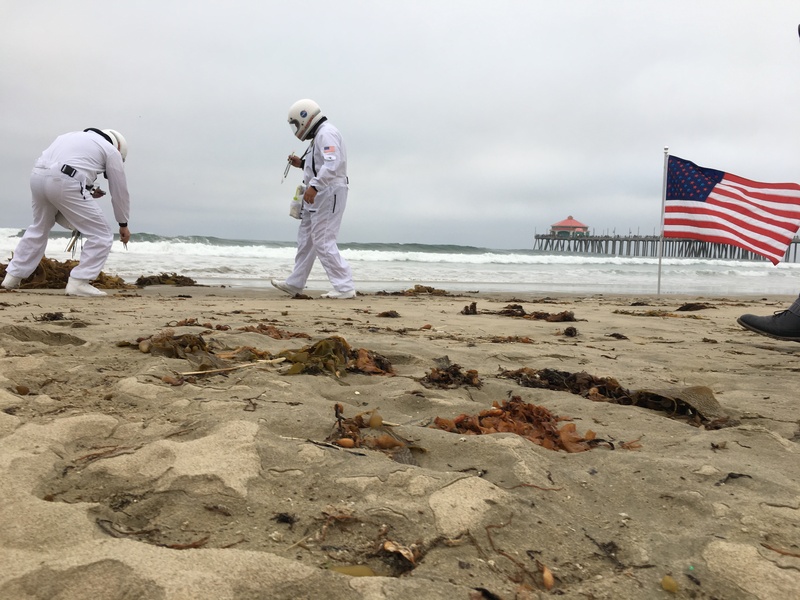 If you are down in SoCal on the weekend of the 17th we invite you to please stop by Torrance Art Museum and check out our most recent NASA (NorCal Artists Seeking America) performance. 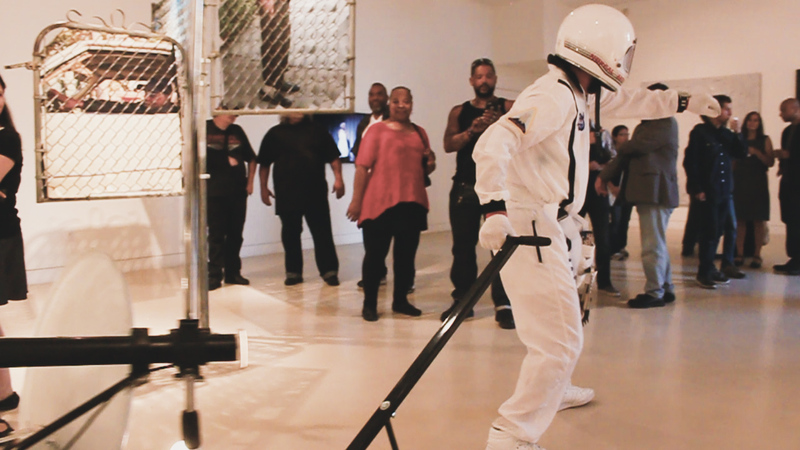 For our upcoming mission we will be landing at the opening reception of TAM’s new exhibition “Why Art Matters” from 7pm-9pm, exploring the museum and investigating new frontiers in the art community. Here are some pics from last weekends performance at Huntington Beach and Irvine, CA. This project is a collaboration with film makers Bryan and Vita Hewitt and will culminate in a full length feature coming to your galaxy soon! Star Date 2017, Oakland California, United States of America, Earth. 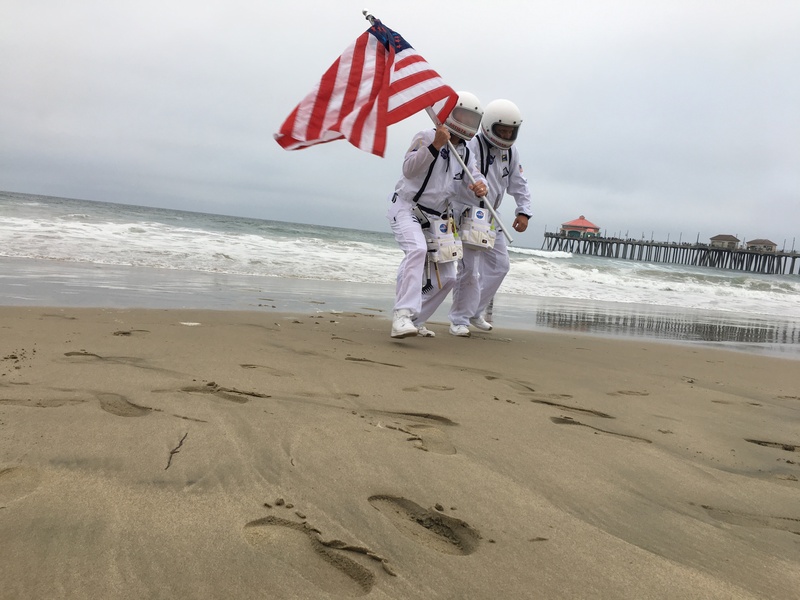 Artists Peter Foucault and Chris Treggiari are part of a special exploration program called NASA, NorCal Artists Seeking America. Their mission, to seek out information and stories that will help illuminate this post-election county that has been turned on its ear. 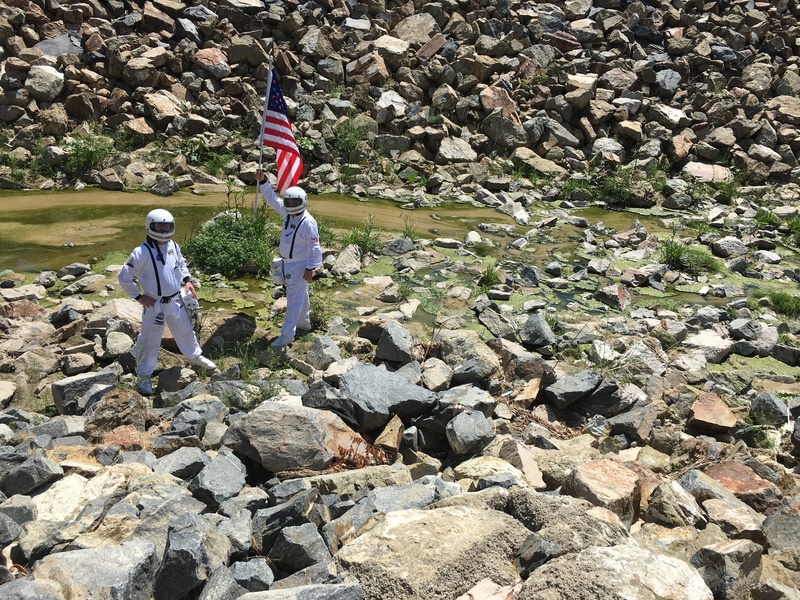 In the wake of 2016, a tumultuous year that ended with an acidic election that blindsided the county and the recent tragedy of the Ghost Ship fire that deeply effected their home base of Oakland California, Foucault and Treggiari will travel the country in their customized explorer suits and try and make some sense of where we are today as a divided country. In a nation they no longer can recognize as a familiar and safe landscape it becomes other-worldly, a surreal and at times hostile place that is fractured by social, economic and politic divisions. 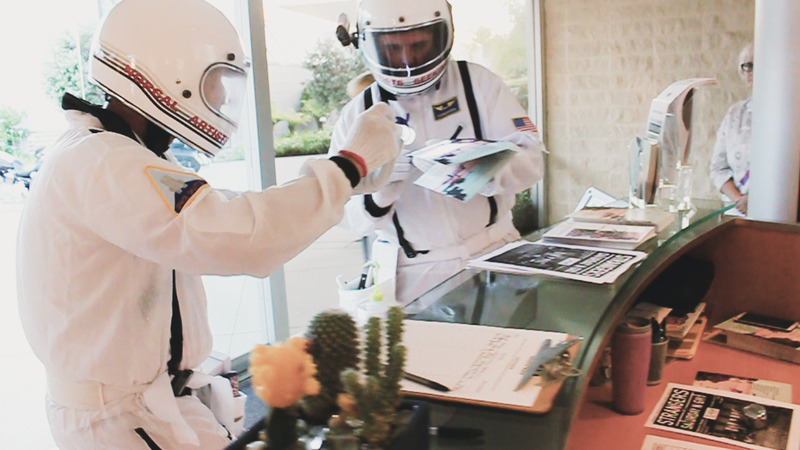 They have become foreign cosmonauts in their own backyards. The mission that they have chosen to accept is to investigate both urban and rural sites and document, collect artifacts, and archive information through this lens of an “outsider/explorer” sent to examine this new and uncharted nation. 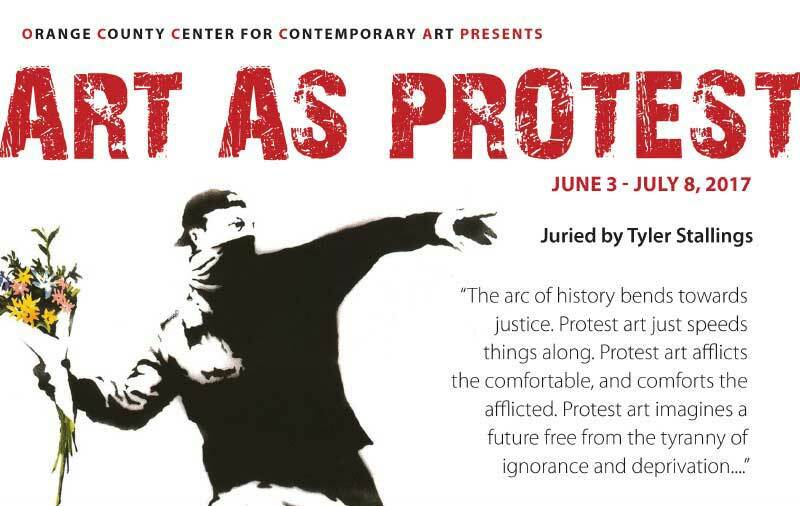 I invite you to check out “The Art of Protest” at the OCCCA. 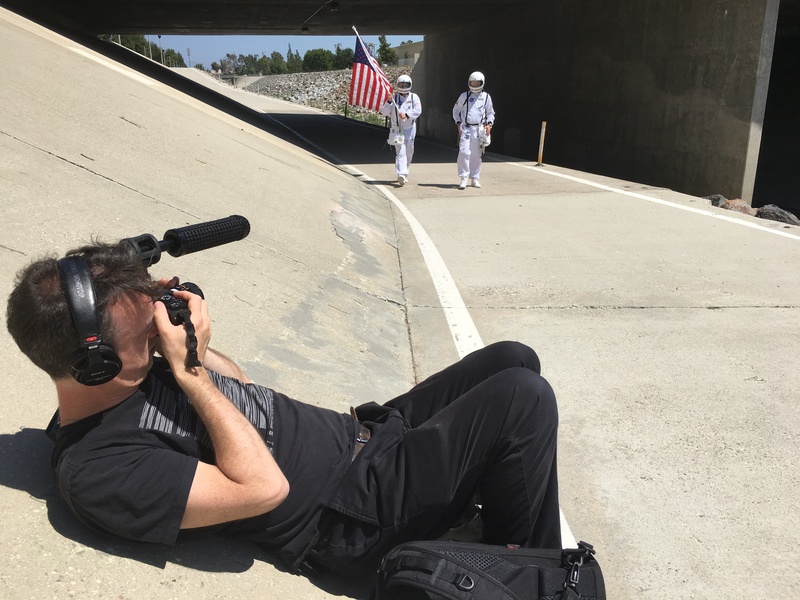 Chris and I have a collaborative video piece (with film maker Bryan Hewitt) titled the Citizens Inauguration: Performance II included in the show. Please stop by and check it out if you are in the area. The exhibition will be up from June 3rd – July 8th with a second artist reception on July 1st from 6-10pm. 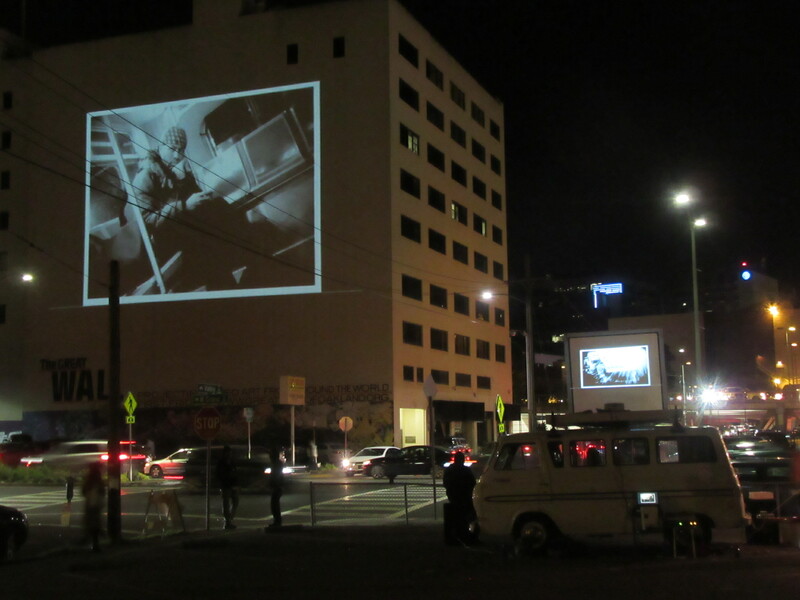 A huge thanks to everyone who stopped by our “On The Road” installation at Friday nights Oakland Art Murmur! A HUGE Thanks also to everyone who participated in our panel discussion and to the talented filmmakers who’s work was featured that evening! 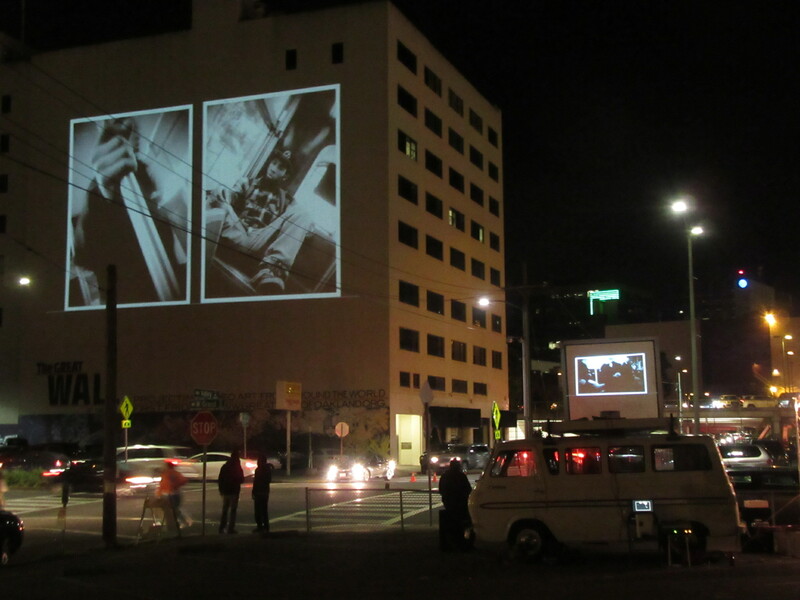 In 2016-2017 the Mobile Arts Platform (Artists Peter Foucault and Chris Treggiari)) is collaborating with Great Wall of Oakland (GWO) and Bay Area artist, curator and educator Victoria Heilweil to create On the Road, a project that invites Oakland residents to share their voice on topics about and related to resident migrations currently happening in Oakland. Tyrone Stevenson, better known as Baybe Champ, is East Oakland’s Scraper Bike King. Back in 2007, he and his cousin Avery Pittman started the Original Scraper Bike. 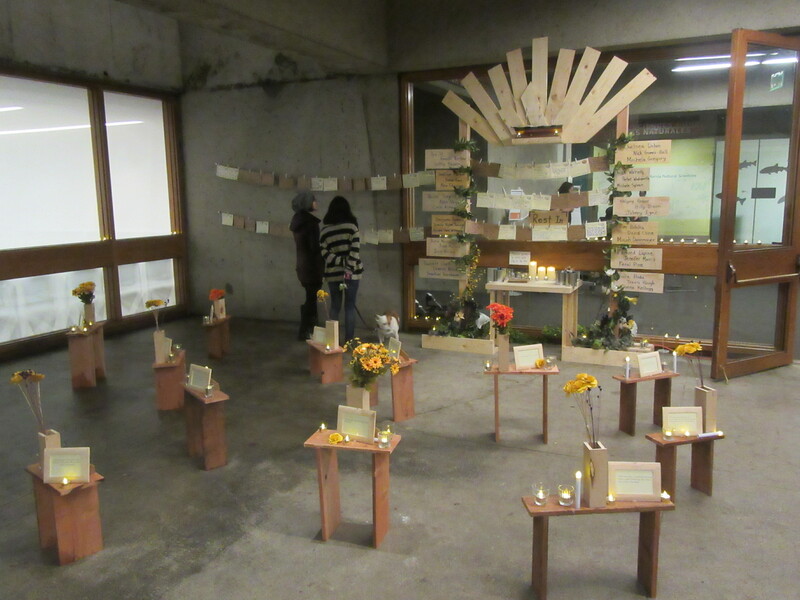 We were honored to be invited by the Oakland Museum of California to create a memorial installation to honor the victims of the recent Ghost Ship warehouse fire. 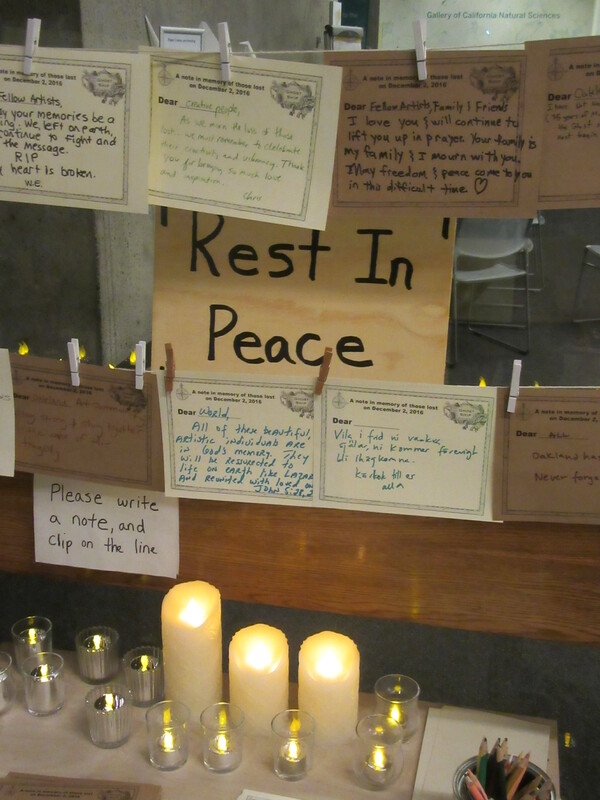 We send our deepest condolences to friends, families and loved ones affected by this tragedy. 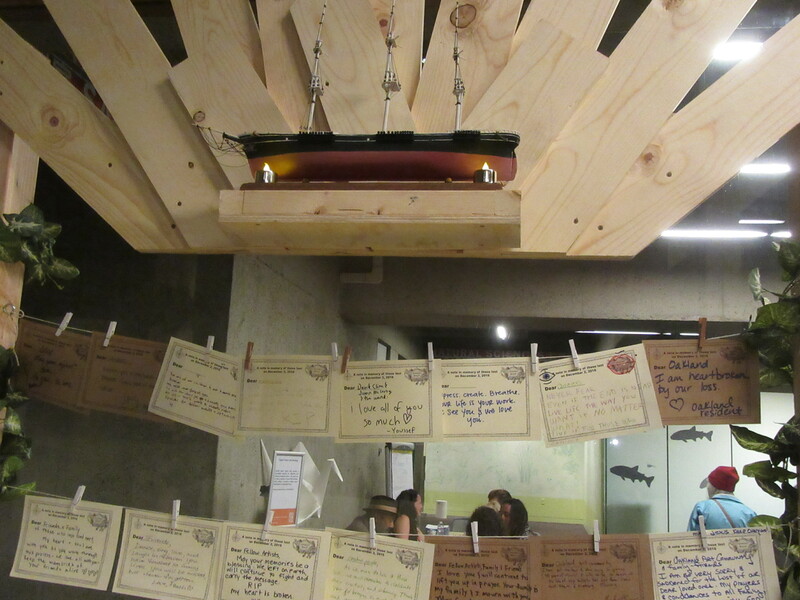 We invite you to come together again at the museum this Friday December 16th to continue adding wishes and sentiments, and to share in celebrating the creative lives that where lost.